India’s T20 International skipper Harmanpreet Kaur left an impressive impact on the cricket fraternity as well as fans after she was spotted carrying a girl who fell ill on the ground when the national anthem was being played. The incident took place before the start of the T20I clash between arch-rivals India and Pakistan in Guyana on Sunday at the ICC Women’s T20 World Cup. 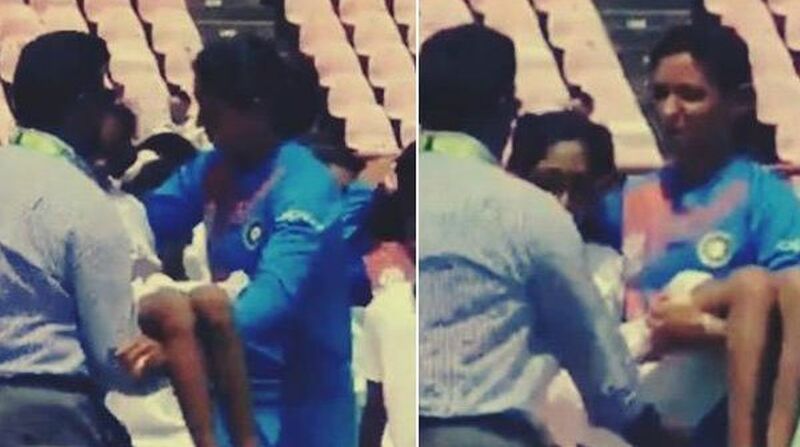 In the video widely shared on different social media platforms, Harmanpreet Kaur can be seen carrying a young girl, who was one of the mascots, out of the field before handing her over to the management after she had fallen sick. After creating history in the opening match of the World Cup against New Zealand by becoming the first ever Indian to score a T20 century, Harmanpreet Kaur remained not out on 14 runs in their second group match as India registered a comprehensive seven-wicket win over Pakistan. Bowling first, Team India did a decent job by restricting Pakistan to a mediocre total of 133 despite four missed chances by Women-in-Blue. Following the target of 134, India won the match with utmost ease as Mithali Raj scored 16th T20I half-century. “Mithali is a key player for us, we have to use her in a smart way. They have a good spin attack and she is our best batter against spin. In high-intensity games, her experience was vital as well,” Kaur added.